Joseph Aloysius Wambaugh, Jr. (born January 22, 1937) is a bestselling American writer known for his fictional and non-fictional accounts of police work in the United States. Several of his first novels were set in Los Angeles, California, and its surroundings, and featured Los Angeles police officers as protagonists. He has been nominated for 4 Edgar awards winning 3, and named a Grand Master by the Mystery Writers of America. The son of a police officer, Wambaugh was born in East Pittsburgh, Pennsylvania. He joined the United States Marine Corps at age 17 (an element he works into several of his novels) and married at 18. Wambaugh is of Irish and German descent. Wambaugh received an associate of arts degree from Chaffey College and joined the Los Angeles Police Department (LAPD) in 1960. He served for 14 years, rising through the ranks from patrolman to detective sergeant. He also attended California State University, Los Angeles, where he earned Bachelor of Arts and Master of Arts degrees. 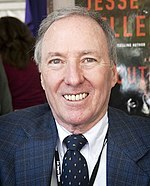 Wambaugh's perspective on police work led to his first novel, The New Centurions, which was published early in 1971 to critical acclaim and popular success. The success of the early books happened while Wambaugh was still working in the detective division. He reportedly remarked: "I would have guys in handcuffs asking me for autographs." Soon turning to writing full-time, Wambaugh was prolific and popular starting in the 1970s. He mixed writing novels (The Blue Knight, The Choirboys, The Black Marble) with nonfiction accounts of crime and detection, a.k.a. "true crime": The Onion Field. Later books included The Glitter Dome (a TV-movie adaptation starred James Garner and John Lithgow), The Delta Star, and Lines and Shadows. In contrast to conventionally heroic fictional policemen, Wambaugh brought a gritty texture to his flawed police characters. Beginning with The Choirboys, Wambaugh changed his approach and began to use dark humor and outrageous incidents to emphasize the psychological peril inherent in modern urban police work. Many characters are referenced by often unflattering nicknames rather than given names, while other characters are given whimsical names to paint an immediate word portrait for the reader. Wambaugh became sharply critical of the command structure of the LAPD and individuals within it, and later, of the city government as well. The character of "Deputy Chief Digby Bates" in The Black Marble, for example, is likely a thinly-veiled lampoon of Chief Daryl Gates. Beginning with The Black Marble in 1977, Wambaugh devoted at least half of a narrative to satirical observations of the mores and extravagances of the Southern California "rich and famous" lifestyle. The Black Marble parodied dog shows and the fading lifestyle of "old" Pasadena, but not entirely unsympathetically. The Glitter Dome explored the pornographic film industry, The Delta Star delved into the politics and intrigue of the Nobel Prize and scientific research, and The Secrets of Harry Bright savaged the Palm Springs lifestyle of wealthy people with second homes, inclinations to drugs and drinking, and restricted country clubs. The Secrets... was also a rather grim testimony to how fathers coped with the loss of a child. With The Golden Orange, set in Orange County; Finnegan's Week, set in San Diego; and Floaters, set in San Diego within the events of the America's Cup yacht racing, Wambaugh broadened the scope of his observations. He was a sharp observer of locations where he lived as a current celebrity himself. In 1992, Wambaugh generated controversy with his nonfiction book, Echoes in the Darkness, based on the murder of Susan Reinert, a teacher in the Upper Merion School District in suburban Philadelphia, Pennsylvania. Critics alleged that the author paid prosecutors in the trial of principal Jay C. Smith to funnel information to him before an arrest was made. Smith's conviction was overturned by the Pennsylvania Supreme Court on the grounds that the prosecution hid the existence of sand that could have supported Smith's case. The chief investigator, John J. Holtz of the Pennsylvania State Police, later admitted having accepted $50,000 from author Wambaugh. Smith sued the police for collusion to falsely convict him, but lost after a federal appeals court concluded that, despite his release, evidence of his guilt remained overwhelming. The earlier murder conviction of Smith's alleged co-conspirator, William Bradfield, remained undisturbed. Bradfield died in prison. One of Wambaugh's most known nonfiction books is The Blooding, which tells the story behind an early landmark case in which DNA fingerprinting, helped solve two murders in Leicester, England. The DNA evidence resulted in the arrest and conviction of Colin Pitchfork. In 2003, Fire Lover: A True Story, brought Wambaugh his second Edgar Award, for Best Crime Fact book. In 2004 he received an MWA Grand Master Award. In the 2000s, Wambaugh also began teaching screenwriting courses as a guest lecturer for the theater department at the University of California, San Diego. In 2006, Wambaugh returned to fiction with the publication of Hollywood Station, set in the summer of 2006. It was his first novel since Floaters (1996) – and his first to depict the officers and detectives of LAPD since The Delta Star (1983). Hollywood Station was highly critical of conditions caused by the federal consent decree under which the LAPD had to operate after the Rampart scandal. In 2008 he followed it with Hollywood Crows, a sequel featuring Hollywood Division Community Relations Officers ("Crows") that featured many of the same characters. This was followed by Hollywood Moon in 2009, Hollywood Hills in 2010, and Harbor Nocturne in 2012, set in successive calendar years and involving officers of Hollywood Station's midwatch (5:00 p.m. to 3:00 a.m.). The only recurring characters to appear in all five books of the series are "Hollywood Nate" Weiss, a cop with dreams of movie stardom; "Flotsam" and "Jetsam", two cops who are avid surfers and always speak in a thick surfer lingo; and "Compassionate Charlie" Gilford, a lazy night-watch detective who functions as a sardonic Greek chorus. The incidents that the various police characters are involved in are based in part on anecdotes Wambaugh collects from working police officers. Many of his books were made into feature films or TV movies during the 1970s and 1980s. The New Centurions was a theatrical film starring George C. Scott released in 1972. The Blue Knight, a novel following the approaching retirement and last working days of aging veteran beat cop "Bumper" Morgan, was made into an Emmy-winning 1973 TV miniseries starring William Holden. It was also adapted as a short-lived TV series starring George Kennedy. Wambaugh made a brief appearance in the pilot as a Desk Sergeant. Wambaugh's realistic approach to police drama was highly influential in both film and television depictions (such as Hill Street Blues) from the mid-1970s onward. Wambaugh was also involved with creating/developing the NBC series Police Story, which ran from 1973 to 1978. The anthology show covered the different aspects of police work (patrol, detective, undercover, etc.) in the LAPD with story ideas and characters supposedly inspired by off-the-record talks with actual police officers. At times, the show's characters also dealt with problems not usually seen or associated with typical TV cop shows, such as alcohol abuse, adultery and brutality. Wambaugh appeared in his second brief acting role in the second-season episode "Incident in the Kill Zone". The show had a brief revival on ABC during the 1988–1989 season. Wambaugh was also involved in the production of the film versions of The Onion Field (1979) and The Black Marble (1980), both directed by Harold Becker. In 1981, he won an Edgar Award from the Mystery Writers of America for his screenplay for the latter film. This was after The Choirboys film adaptation had met with poor critical and audience reception a few years earlier. All three films featured performances by then up-and-coming actor James Woods. The Glitter Dome, which starred James Garner, John Lithgow and Margot Kidder, was a 1984 film for HBO. Fugitive Nights was made into a 1993 feature film of the same title. ^ "Joseph Wambaugh Biography - eNotes.com". eNotes. Retrieved September 8, 2018. ^ "Edgars Database | Search the Edgars Database". theedgars.com. Retrieved September 3, 2018. ^ Mitchell, Sean (February 26, 1989). "THE CRIMES OF JOSEPH WAMBAUGH : A Fascination With Sociopaths Lures the Cop Novelist to England--and a High-Tech Detective Tool". Los Angeles Times. Retrieved May 16, 2016. ^ Wambaugh and his wife Dee lived in nearby Rancho Mirage until 2001. See: Meeks, Eric G. (2012). Palm Springs Celebrity Homes: Little Tuscany, Racquet Club, Racquet Club Estates and Desert Park Estates Neighborhoods (Kindle)|format= requires |url= (help). Horatio Limburger Oglethorpe. p. 475 (location number). ASIN B00A2PXD1G. ^ William C. Costopoulos, Principal Suspect: The True Story of Dr. Jay Smith and the Main Line Murders (Philadelphia: Camino Books, Inc., 1996), 240, 245, 264. ^ "Category List – The Grand Master | Edgars Database". theedgars.com. Retrieved September 3, 2018. ^ "Joseph Wambaugh Biography - eNotes.com". eNotes. Retrieved September 3, 2018. ^ "Glitter Dome, The (1984) - Overview - TCM.com". Turner Classic Movies. Retrieved September 3, 2018. For commentary on the book, see: Wild, Peter (2011). Paradise of Desire: Eleven Palm Springs Novels. Tucson, AZ: Estate of Peter Wild. p. 281. OCLC 748584112. WAMBAUGH, Joseph, International Who's Who.